Can the process of healing pain actually be a powerful teacher for your spiritual growth, inner work, and wellness journey? On Wellness Force Radio episode 253, Functional Diagnostic Nutrition Practitioner, HeartMath Certified Coach, and Author of Sick of Being Sick, Dr. Brenda Walding, reveals how you can let nature nurture you whenever you need to connect with yourself, how oregano oil helped heal her infection when antibiotics couldn't, and what she did to embrace her feminine identity while she had breast cancer; especially after her mastectomy. Follow along as Brenda shares her mission to serve women by helping them heal, thrive, and create more harmony in their lives. Chronic illness – whether you are dealing with cancer, autoimmune disease, or a slew of mysterious symptoms – cuts to the core of a woman’s being. You may feel like you are drowning in a sea of pills, treatments, programs, diets, and debt that never quite gets you the results you crave. You would do anything – if you knew what to do and who to listen to. Wellness expert Dr. Brenda Walding spent the last decade navigating debilitating chronic illness (including breast cancer) and came to understand the crucial components required for true healing and thriving. Now it is her mission to help other women learn how to tap into their innate healing power and finally begin living the lives they crave – lives full of well-being, happiness, connection, peace, and joy. This heartfelt healing manifesto provides a comprehensive roadmap to empower and support you as you navigate your healing path. 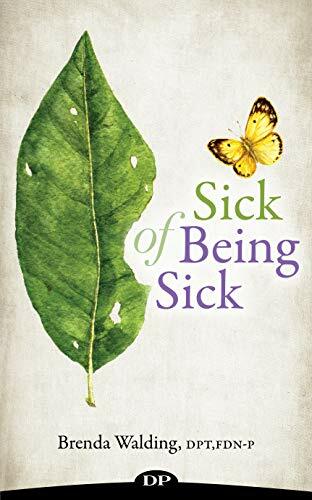 If you're ready to begin your journey to wellness, Sick of Being Sick will be your portal of transformation and opportunity to bring you back to your heart and to experience the health and wholeness you desire. Why she chose to not go down the traditional path of chemotherapy and radiation to heal her breast cancer but decided to try natural medicine instead. The importance of being in a good environment in order to heal the body, mind, and soul. Benefits of forest bathing and essential oils to help improve your health and mindset. What it was like to grow up with her father being in the military, need the emotional support that she lacked, and have the inner struggles she faced while trying to achieve a full life. How women can be more aware of and honor their natural feminine self. The story of how her illness came about soon after her marriage began and what signs she noticed as her health declined. The book, The Cure Is in The Cupboard, by Dr. Cass Ingram and how it transformed her life and introduced her to holistic health and natural medicine. How her question of faith was tested when she found out she had breast cancer. Her spiritual connection and how it has shifted as she healed. How pain can be a powerful teacher and what it taught her while she had cancer. Whether cancer is solely caused by our genetics and outside factors or if it's something our spirits bring to us to forge greater growth. The alchemy of surrender and how she finally let go after her mastectomy. The exploration of fully embodying a feeling and why it's normal to be afraid of being stuck. Why our emotions are so important in order to help us embrace this full human experience. Steps to give yourself permission to feel your physical energy and emotions. The constant idea of perfection that we face as a society and how stillness and inner work can help combat it. Why loneliness is such an epidemic that's adding to the stress, anxiety, and fear in our lives. How to find a true, deep connection with other people in your life. How to set up your morning practice to connect with yourself and the world around you for better wellness. Brenda Walding holds a Doctor of Physical Therapy (DPT) degree from Hardin-Simmons University and a bachelor of science degree in movement science from Texas Christian University, where she played Division I soccer for four years. She is co-owner and director of nutrition at Alchemy fitness+ flow, a holistic-based gym in Austin, Texas. Brenda is a Certified Functional Diagnostic Nutrition practitioner and enjoys using this knowledge to help others improve their health. She is a certified Tao Flow Yoga instructor as well as an Independent Product Consultant (IPC) for doTerra essential oils. Brenda loves to learn (mostly about health, food, and the body), be in nature, read, practice yoga, and spend time with Chad, friends, and family.